Dr. Krishna Raman has achieved great success in cost effective preventive and curative healthcare by integrating Yoga and Western Medicine in his clinical practice. He has seamlessly optimized patients’ overall health and wellness with the best of what both modern and ancient sciences can offer. Medindia interviewed Dr. Krishna Raman MBBS, FCCP (Internal Medicine) and trained in Yoga by the legendary yoga expert B.K.S. Iyengar in Poona. Dubbed by the Economic Times as the ‘Man with a mission’, and widely known as the ‘dancers’ doctor’ Dr. Krishna Raman does more than just scribble prescriptions—he guides the patients on the principles of good living and healthy lifestyle. Medical practice worldwide has only recently woken up to promote patients’ holistic health. Dr. Krishna Raman has tested and tried this method of complementing Yoga with western medicine for the last 25 years. True to the maxim, “the proof of the pudding is in the eating,” his patients are from all over the world—Germany, Mexico, UK, US, Singapore, Sri Lanka and many other far corners. Some patients recovered so well that they went on to become Yoga teachers themselves, and vouch for the success of this method of striving for holistic health. Dr. Krishna Raman spoke to Medindia from his clinic that has a tastefully designed Yoga room annex in a quiet neighborhood in Chennai, South India. Question: You are a doctor with degrees in western medicine. Yet you have published many medical papers in various forums showing the benefits of complementing western medicine with Yoga. What prompted you to integrate Yoga with western medicine in your clinical practice? Dr Krishna Raman: I have been practising Yoga since I was 14 years, even before I entered a medical college. My parents have taught me a disciplined life style that includes exercise in daily life and have also set an example of value based living. Medical education helped to lend a perspective to the yogic postures in terms of health benefits. As a medical student I won awards for yoga demos in inter-collegiate cultural events. A German patient who was suffering from nocturnal cramps for nearly 25 years was referred to me by a patient of mine who knew of my interest in Yoga. I realized all she had was muscle cramps and taught her some asanas and in just three days she was fully cured. She was fully convinced of the benefits of practicing yoga and is now a yoga teacher herself. I was amazed at the therapeutic potential of yoga after that and delved deeper into the ancient science and there has been no looking back ever since. I continue to research yoga with Ultrasound and other techniques to prove or disprove the effects of yoga. This scientific approach is very important. With humility I would like to mention that my perspective of yoga has undergone a total transformation after I was fortunate enough to be drawn into the fold of Bhagawan Sri Sathya Sai Baba. Question: Do you administer yoga therapy to all your patients? Dr Krishna Raman: No. Only if the clinical condition demands it and most importantly, only if I feel that the patient is able to do the asanas will I opt for yoga therapy. A patient who had almost lost total bladder and bowel function came to my clinic asking for yoga therapy. I advised immediate surgery. CHENNAI: Lectures, bhajans and plays related to spirituality that’s what the department of prisons has lined up for the inmates of Puzhal prison. The volunteers of Sri Sathya Sai Organisations put together a programme for inmates of the prison to celebrate the New Year. “The volunteers staged a play on Buddha’s life, which showed how love can transform a person. The play had a deep impact on the inmates, so we thought that if Sri Sai Baba could talk to the prisoners, it would have a greater impact,” said R Nataraj, director-general of prisons. Sai Baba is expected to visit the state in a couple of months and the department is planning to invite him to the prison. Sri Sathya Sai Organisations had earlier conducted similar programmes before the prison was shifted to its present location in Puzhal. “We realised that if we introduce spiritual ideas into the human mind, it brings about a change in any person. So we organised this programme for the inmates of the prison,” said N Ramani, state president of the organisation. People in the age group of 18-35 years were involved in the programme at Puzhal, which included a one-and-a-half hour bhajan session. The organisation also distributed 4,500 laddoos to the inmates of all three prisons on the Puzhal campus and donated a set of books on Sai Baba’s life and principles to the prison library. “The department showed interest in having regular programmes. We are ready to prepare the agenda if they send us a written proposal. We know that they wouldn’t want to be lectured, so we would be conveying messages by staging plays and screening movies,” Ramani said. The programmes would first be conducted at Puzhal. Later, volunteers from other centres would be asked to attend these programmes to learn how they are conducted and take them to other jails and sub-jails in their areas, he said. On December 31, the inmates also got to listen to Swami Amarananda, a yogi from Ranchi associated with the Yogadha Sathsanga Dhyana Kendra, who spoke on meditation. The centre also donated 135 books on meditation in Tamil, Telugu, Malayalam and Gujarati to the Puzhal prison library. On December 25 in a first-of-its-kind initiative the department allowed inmates of all eight Central prisons, sub jails and Borstal schools to meet their family members between 9 am and 4.30 pm. Being a national holiday, the prison is usually closed to outsiders on December 25. The Omnipresent One cares for you in your absence as much as He enthralls you in your presence. One such account by a student of Bhagawan Sri Sathya Sai Baba‘s University sheds light on the affection par excellence of the Divine Mother. Read on for an account by Sri P.S. Priya Chakravarthi, an alumnus of Sathya Sai University as published in Fragrance – A Tale of Love, souvenir brought out by the School of Business Management – Accounts and Finance, Sri Sathya Sai University. It was during Dasera in 1995, just after my B.Sc. (Honours) Course, in the Brindavan campus of SSSIHL. All the Brindavan boys who stayed back for the vacation were accommodated in the old Hostel located near the Mandir. As usual, the students used to rush inside the Mandir and were often selective about their sitting locations. I used to have a particular seat where I sat for Swami’s Darshan. May be it was my perception, but Swami appeared to avoid looking in the direction where I used to sit. One day during Darshan, observing my vacant seat, Swami enquired about my absence from my brother (Vamsi, MBA 1995-97) and asked him where I was. My brother was perplexed and he feared that I was absconding from Darshan with no valid reason. Once the Darshan got over and Swami went inside the interview room with a few devotees, my brother immediately rushed to the old Hostel where I was sleeping. He approached me with anger but seeing me, his anger melted down. He saw me in lot of pain and my face wet with sweat. I was finding it difficult to even sit down on my bed. I was struggling with excruciating pain at the right lower side, but I had not mentioned about this to anyone. He immediately went back to the Mandir and Swami again approached him and asked him as to where Chakravarthy was. My brother promptly replied that I was in agony and was experiencing unbearable pain. This shows the Omnipresence of Swami. 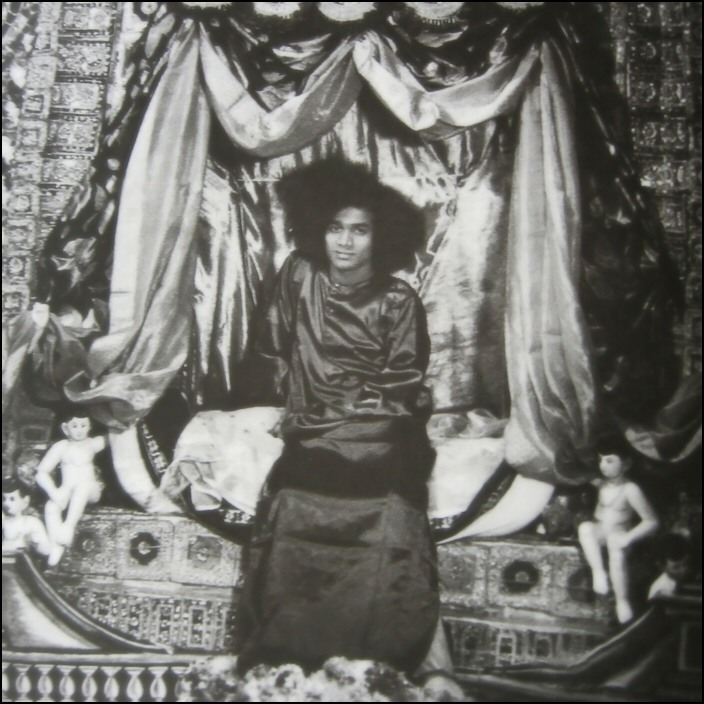 Bhagawan exhibits His Love for all His beings where ever they are, immaterial of whether they are present physically in front of Him or not. Swami smiled at him and immediately calling a doctor, told him to take me to the Super Speciality Hospital. He also directed my brother to accompany me. I was transported to the Hospital and was given medical attention. In the evening Swami again called my brother and the doctor, materialised Vibuthi and gave money to buy tender coconuts to be given to me with instructions that the Vibuthi should be applied externally at the place where the pain occurred. It reached me by evening. This act of Grace repeated for 3 days (Swami materialising Vibuthi, giving money to buy tender coconuts to be given to me)! 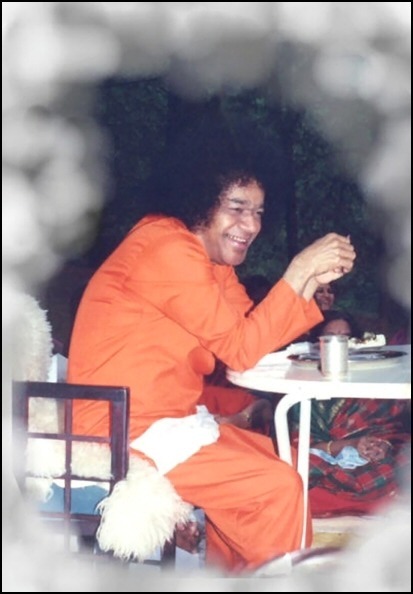 The 3rd day, Swami instructed that the Vibuthi should be taken with water. Then came the D-day, when the senior surgeon recommended that I should be operated upon immediately. I was in a dilemma and could not accept the fact that I was suffering from appendicitis. But the situation demanded surgery and I had no choice. Prior to my operation, I wanted to have Swami’s Darshan and possibly, a chance to talk to Him about my operation (shows my ignorance!). I was permitted for Darshan and was sitting in the front line, mainly to catch the attention of Swami. As usual Swami was busy and He was distributing Prasadam. I was not making any attempt to talk to Him as He was very busy, but the doctor on the verandah began insisting that I should take a chance to talk to Swami. Then, by Swami’s Sankalpa I got a chance to talk to Him. I told Swami, “The doctor says I need to be operated; I need your Grace and Blessings”. Swami gave a stern look and He moved away from me without saying a single wor d. This gave me a shiver that chilled my bones! I was baffled and scared. My operation was scheduled for the next morning and the doctor administered some medicines. He advised his team to do an initial scan on me to get more clarity about my ailment. But lo and behold! When the reports of the scan arrived, the protrusion of the appendix was literally not visible! The team wrestled with the machine but it always showed a negative report for the protrusion. I was brought back to my ward. The senior doctor was astonished, but was ready to accept this as an instance of the Omnipotence of Swami. I was discharged in a day and I went for Darshan. This time Swami gave me a smile and moved on silently! This is just one of the many incidents showing His Omnipresence, Omnipotence and Omniscience.